Easter is right around the corner, and nothing says Easter brunch or dinner like baked ham! 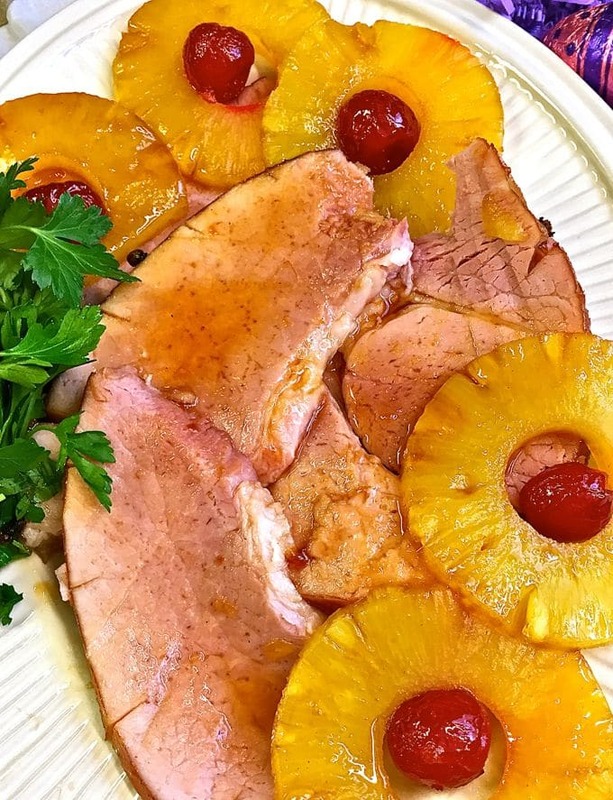 Lots of it, especially this classic bourbon glazed ham with pineapple! 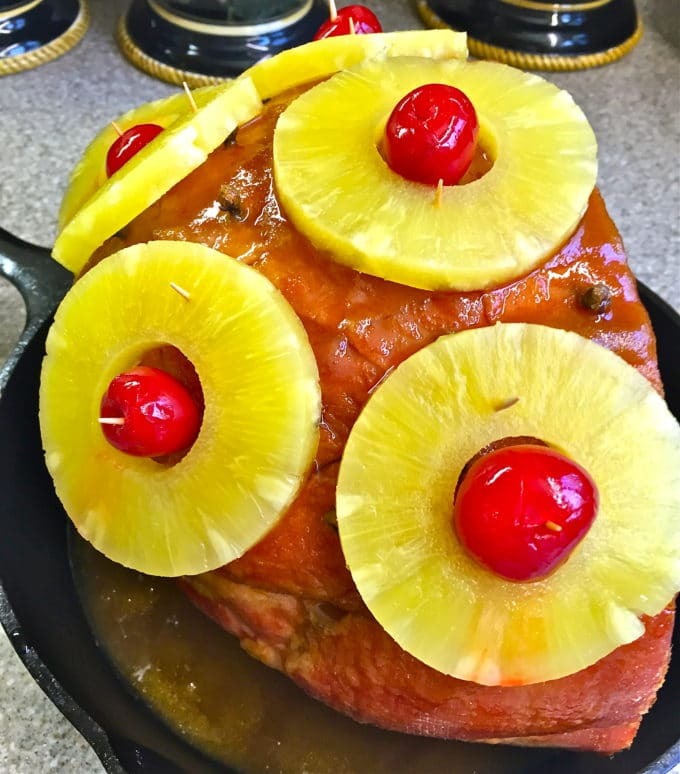 And, I know you, and your family or guests will love, this easy baked ham recipe complete with traditional pineapple rings and maraschino cherries, with its yummy sticky sweet and savory brown sugar bourbon glaze! This brown sugar bourbon glazed ham will be the star of the show for your Easter Brunch or Dinner. We usually have this delicious brown sugar bourbon glazed ham with either my husband’s specialty, scrumptious Sweet Potato Casserole, or my yummy Southern Potato Salad, and for a show-stopping dessert, Classic Southern Strawberry Shortcake or Luscious Lemon Swirl Cheesecake. You will also probably want to round it out with something green, maybe a nice salad or roasted asparagus. Of course, you can’t go wrong with these popular sides either: Roasted Carrots with Lemon Vinaigrette, and Green Bean Bundles Wrapped in Bacon. Looking for more Easter menu ideas? Check out these posts: 33 Dazzling and Delicious Easter Desserts or 38 Easy Easter Dinner Recipes! 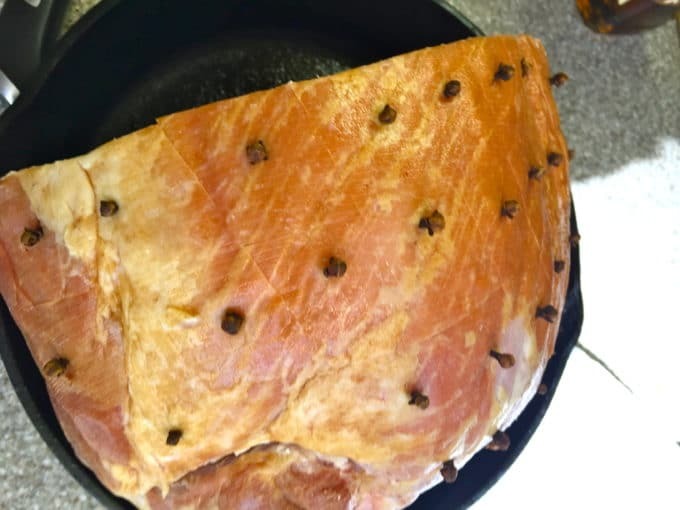 My Mom had the best-baked ham recipe! This was before the days of spiral cut hams and pre-cooked hams. I remember the ham would take forever to cook and she would have to remove the rind before she could score it and add the cloves. 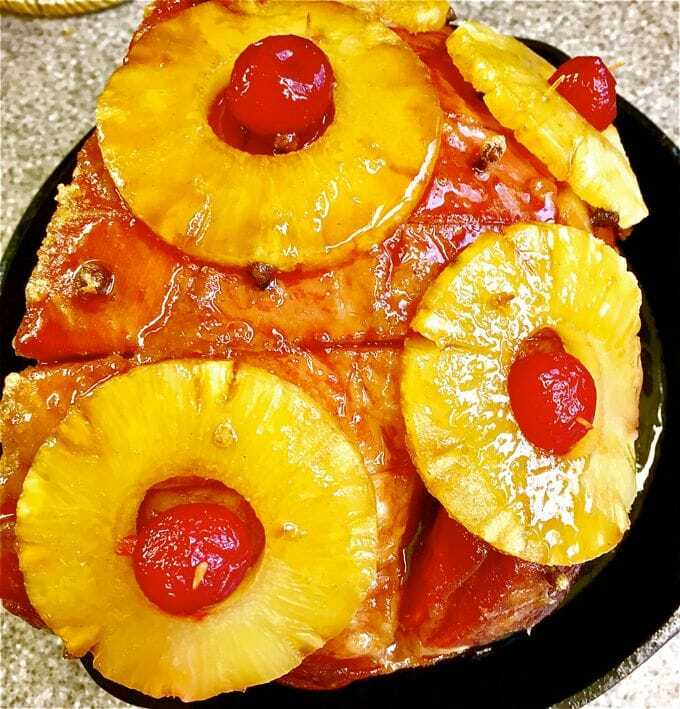 And then there was always a delicious brown sugar glaze covering the ham, topped with pineapple slices, and cherries. The decadent 5-star baked ham recipe I’m sharing today is my Mom’s, with a few minor additions. I consulted with both of my sisters, and we think her glaze was just brown sugar and possibly pineapple juice from the sliced pineapples. To this, I added just a touch of bourbon and Dijon mustard to ramp up the flavor a bit. And, to save time, I am using a bone-in pre-cooked ham. 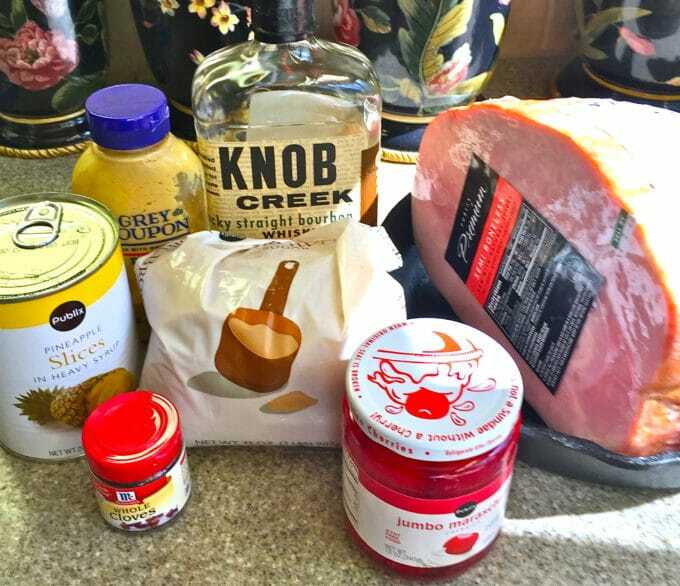 To get started making your brown sugar bourbon glazed ham, gather your ingredients which are: a 7-8 lb bone-in pre-cooked ham, brown sugar, pineapple slices, maraschino cherries, bourbon, whole cloves, and Dijon mustard. As you can see, it’s a short list of ingredients and only takes a few steps to start making memories for your family this Easter. Using a sharp knife, score the ham by cutting shallow lines across the top of the ham all going one-way about an inch apart. Then, cut shallow lines across the lines you already cut making a diamond pattern. Insert a whole clove in each diamond or square. How long to bake a ham? Place the ham cut side down in a baking dish and cover tightly with aluminum foil. Bake for 1-1/2 hours or until an instant-read thermometer inserted in the center reads 145 degrees. Meanwhile, mix the ingredients for the glaze in a small bowl. Remove the ham from the oven and turn onto its side. Spoon the glaze generously on top of the ham, making sure to cover all exposed areas. Top with pineapple slices and cherries. You can use toothpicks to secure the pineapple and cherries. Put back in the oven uncovered this time and bake for approximately another 30-35 minutes or until the glaze is sticky and the sugar has melted. Serve warm or at room temperature. Pour any remaining glaze from the pan over the ham before serving and also be sure to remove the cloves. Nothing says Easter dinner like baked ham, especially this classic Brown Sugar Bourbon Glazed Ham! 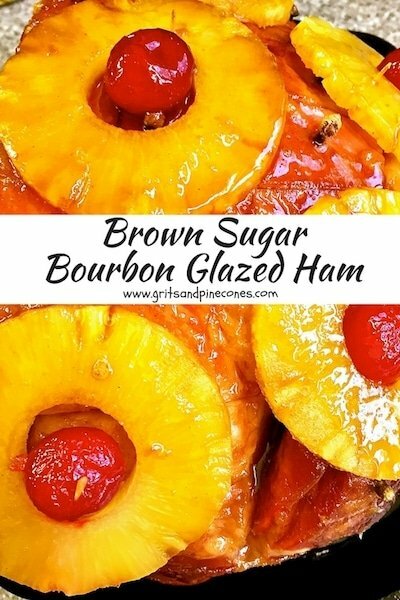 And, I know you, and your family or guests will love, this baked ham recipe complete with traditional pineapple rings and maraschino cherries, and a yummy sticky sweet and savory brown sugar bourbon glaze! Meanwhile, to make the glaze, mix the brown sugar, bourbon and dijon mustard in a small bowl. Add just 1 tablespoon of the pineapple juice and then add more if needed to get to your desired consistency. Put the ham back in the oven uncovered this time and bake for approximately another 30-35 minutes or until the glaze is sticky and the sugar has melted. Yum. I haven’ only rarely had ham this way. My mom never really made it with the pineapples and cherries! But looking at your recipe, makes me want to make it like that! Such a great, sweet-and-salty dish! Love the addition of cloves here. Glazed ham is just the best. Always love an old school recipe!